Gov. 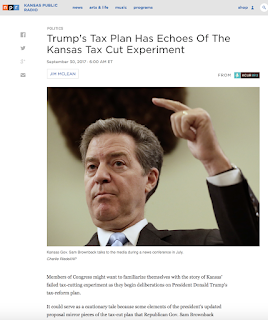 Brownback’s tax experiment brought havoc to the Kansas budget, and put the state’s general fund in severe financial distress. But in June, a bipartisan supermajority of lawmakers rescinded those policies in a dramatic veto override and put Kansas back on a more stable financial path. Income tax receipts took a steep $713 million fall in FY 2014, the first full fiscal year that the Brownback tax cuts were in effect. From a high of $2.9 billion in FY 2013, receipts dropped to $2.2 billion and then stayed down at the $2.2 to $2.3 billion level all the way through the just completed FY 2017. Total tax receipts follow the same basic pattern, although sales and cigarette tax rate increases that took effect at the beginning of FY 2016 made up for a small portion of the income tax loss. The newly passed tax bill, eliminated the LLC loophole, stopped the March to Zero (a formula in state law for future tax cuts), and moved income tax rates higher, though still below the rates in place before 2012. The new law had only a minimal effect on FY 2017 receipts, but official estimates forecast that income tax receipts and total receipts will now recover enough in FY 2018 to reach revenue levels from five years ago. But a key question: Are the forecasts of new revenue accurate? We will not know for sure until May. Big changes to tax law can be quite difficult to forecast with precision. Brownback’s tax policy made LLC pass-through income, self-employment income, rental income, and farm income tax free. But under the new law, income earned from those sources during calendar year 2017 will again be subject to taxation. Normally people owing taxes on that income would make quarterly payments in April, June, September, and January or face a penalty. However, in this changeover year, individuals can choose to skip the quarterly payments without risking a penalty, and make one large payment by next April 15 when they file their 2017 tax return. We will simply have to wait until all those returns are received and counted to know the accuracy of the new forecast. In the meantime, it’s important to watch each monthly revenue report to understand whether receipts track above or below expectations. But those monthly reports should also be viewed with caution, knowing that a large share of the new revenue may not appear until next spring. 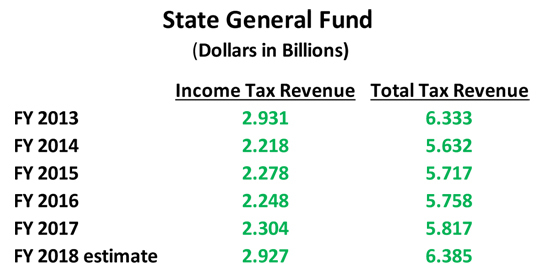 Even with the expectation of new revenue, Kansas finances remain very fragile. Kansas has endured years of structurally unbalanced budgets. Reserves have been decimated, the highway fund compromised, and debt levels dramatically increased. And with school funding costs moving up, basic state expenses will continue to exceed revenue. By undoing the Brownback tax policies, lawmakers took a huge first step toward recovery, but repairing all the damage will take time. Much more work remains ahead to nurse Kansas back to financial health.